For Thanksgiving, we decided to go out and visit Chase, Brighton’s older brother in San Diego. I’ve only been once, for Ragnar, and I was working the whole time so I didn’t explore very much. We had 3-4 days to spend exploring the city for Thanksgiving and my birthday! This is the first post in a three part series of our trip to San Diego and Arizona. For Days 3 & 4, click here. For Days 5 & 6, click here. The drive from Salt Lake is between 11-12 hours, depending on your stops and the traffic. We stopped in Vegas for gas, and to take a photo with the Vegas sign. 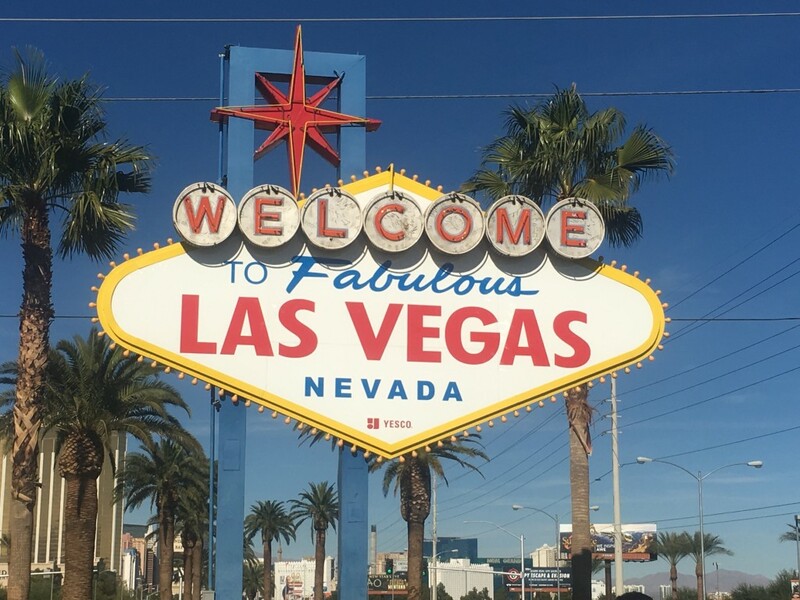 I’ve never been to Vegas (even driving through), and I wanted one. Such a tourist trap! But oh well, sign picture – CHECK! After Vegas, we hit traffic pretty much continuously for the remainder of the trip. Ugh, how do people in California handle this traffic?! We checked in to the hotel— DoubleTree by Hilton Hotel San Diego Downtown— and headed to La Jolla, about a 20 minute drive. For my birthday dinner, my only request was something seafood or sushi and felt “special” (basically, not a chain, and not extremely cheap). Chase and Edyta picked Shiku which was a 10 minute walk from their apartment. I was impressed! So yummy! Their Shiku roll was exactly what I like in sushi— warm, creamy, and spicy. We also tried Sashimi, which I’d never tried before. Sashimi is thinly sliced raw meat—usually fish, such as salmon or tuna—that is served without rice. I’m not entirely sure of the fish we ate— salmon, tuna, and yellowtail, I believe— but it was delicious! Whenever I am in coastal cities, all I crave is seafood and this was exactly what I was looking for! Happy birthday to me! After dinner, we went back to the hotel and crashed in the comfy big bed! This is the view from our hotel balcony at night. 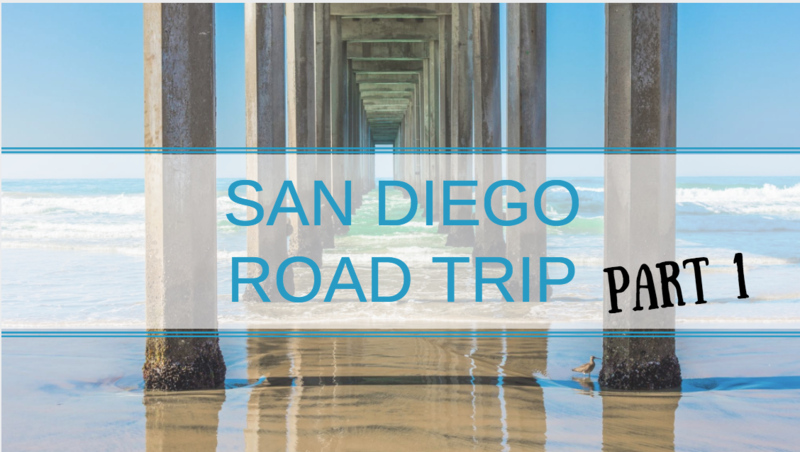 For our first real day in San Diego, we wanted to hit some popular, pretty places to explore. Our hotel was located in Little Italy, an up-and-coming neighborhood in San Diego, near the Gaslamp Quarter downtown, but without the hustle and bustle of the downtown area. 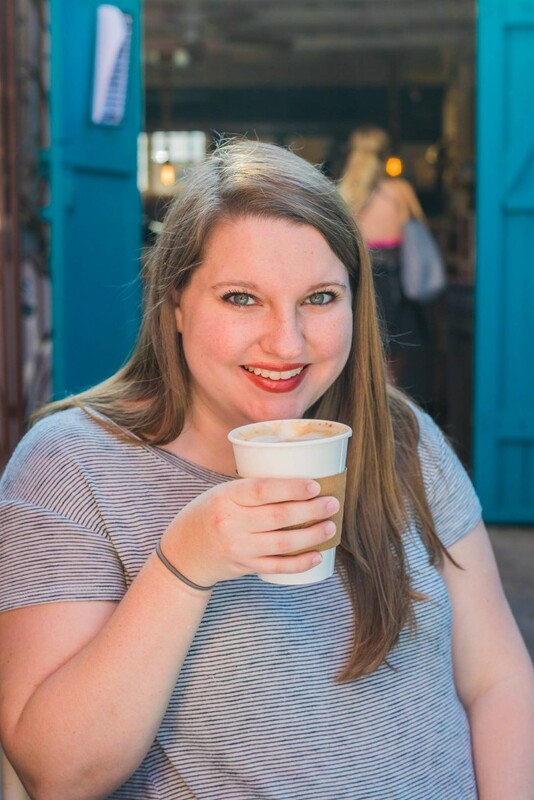 I loved staying in this little neighborhood because we were close to everything, within Ubering or walking distance and we could walk to plenty of super yummy restaurants and coffee shops. The neighborhood has a history of Italian immigrants and the tuna capital of the western US. 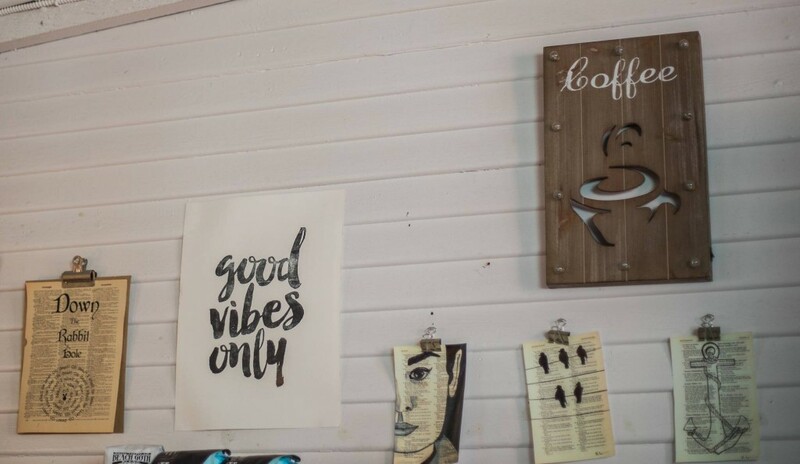 One of the locals we talked to said that the neighborhood has been reviving itself for the past 20 years, and has recently become more of a hip and urban spot to visit in San Diego. Upon searching for coffee shops, we found Heartsleeves Coffee within a 5 minute walk of our hotel. It’s a cute, Alice in Wonderland themed shop with really tasty lattes. If you go, get the Bee Loved Latte. You won’t regret it. The owner-operator Brandi was super nice as well. I really liked the outdoor patio area, with the bright blue walls. It was the perfect way to start our trip in San Diego. 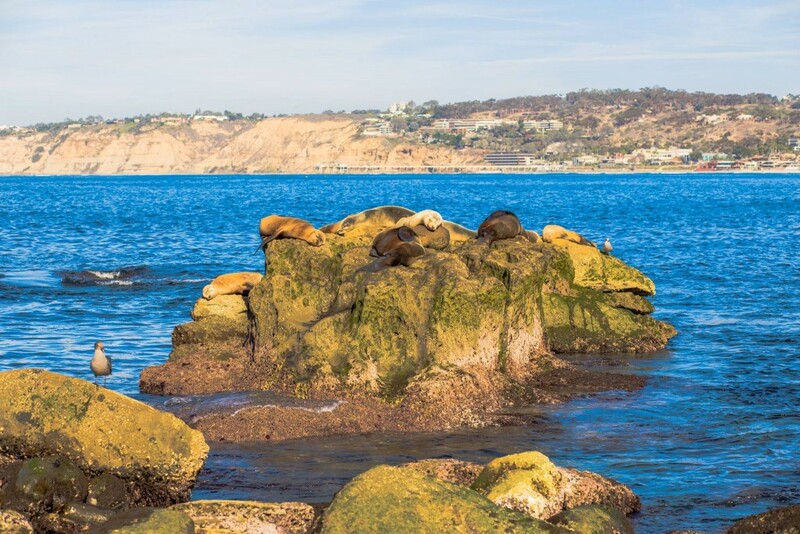 Next, we headed over to the La Jolla area. This is another neighborhood/area in the San Diego area. 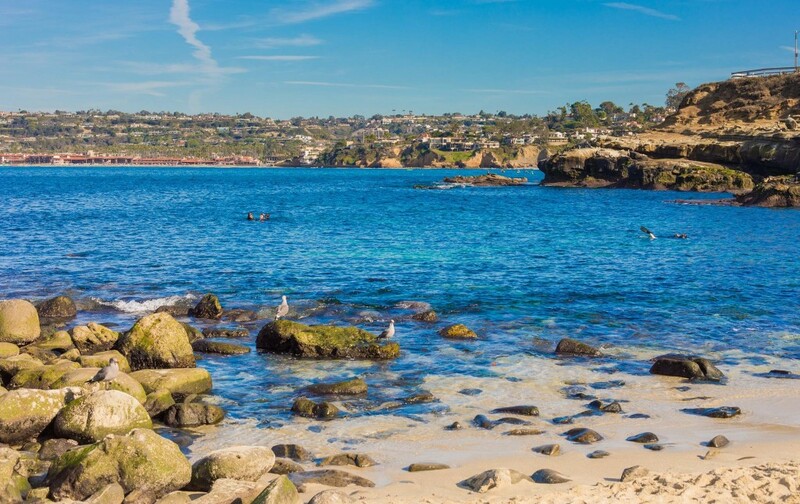 The name “La Jolla” means the jewel. There’s a nice downtown area filled with popular clothing brands, local restaurants, and art galleries. It’s a lovely area to spend an afternoon. We walked over to La Jolla Cove from Chase’s place. Dan and Chase snorkeled while Somer, Brighton, Leo and I enjoyed the beach and views. Leo had his first toe-dip in the Pacific Ocean. After hanging out at the beach with everyone, I really wanted authentic fish tacos so we ended up at Puesto. 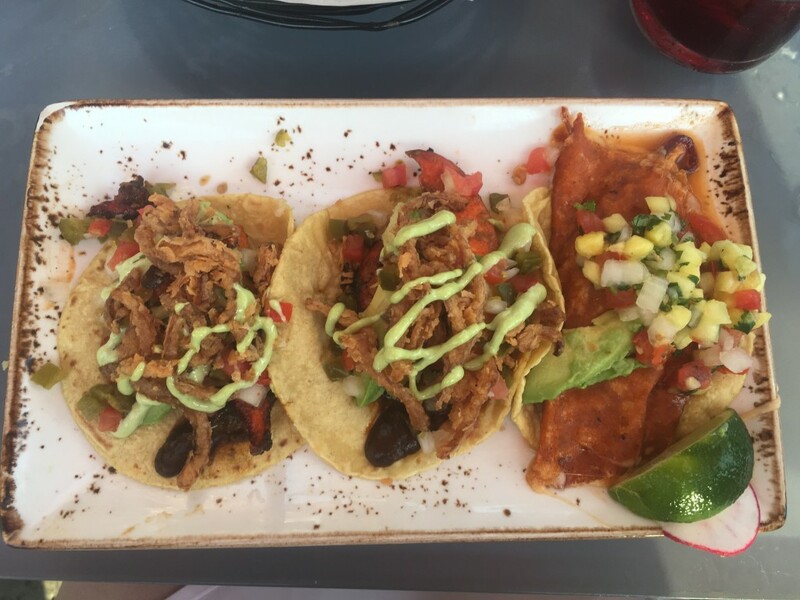 They have amazing salsa and guac, along with a variety of street tacos. My favorites were the Lobster and the Striped Bass. They were a fun mix of traditional and inventive flavors – fresh and yummy! No tourist trip to San Diego is complete without a walk down 5th Avenue in the Gaslamp Quarter. After our beach adventures in La Jolla, we relaxed at the hotel for a while and went out for a light bite to eat and some drinks in the tourist area. 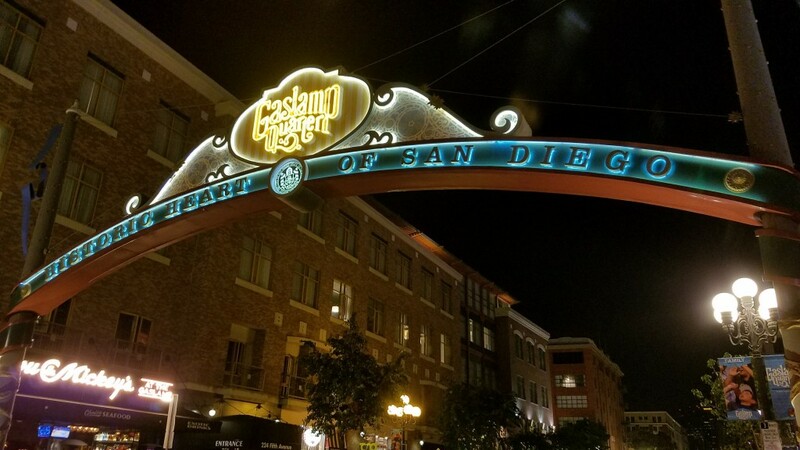 The Gaslamp Quarter gets its name from its history, and it includes 94 historic buildings, most of which were constructed in the Victorian Era (1830s-1900s), and are still in use with active tenants including restaurants, shops and nightclubs. We grabbed a bite from barleymash on 5th avenue because it looked fun and yummy. We ordered an appetizer of their handmade pretzels and dip. Simple but hit the spot. We also both tried local ciders, which we both liked. We wandered around the 5th Avenue bars after our bite. Our adventures in San Diego and Arizona continues here and here! How do you entertain yourself on long drives when there’s a lot of traffic?